No more hiding down the block when a bomb goes off. Now it’s up close and personal, with blood on their hands. And when the dirty work is done, the perpetrators explain themselves to witnesses. 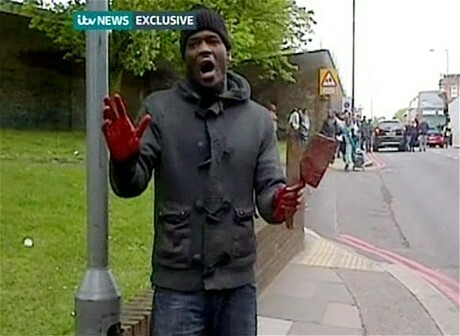 British soldier Lee Rigby was murdered last week, Wednesday May 22, 2013, in the Woolwich district of London. According to news reports, the first 911 call came in at 2:20pm. The attack itself would have occurred at least one or two minutes earlier. While returning to his nearby barracks, Rigby was run down by a car. Witnesses first thought it was an accident. But then two attackers got out of their car and began hacking at Rigby. One early witness thought they’d gone to help the victim, until he saw their cleavers. 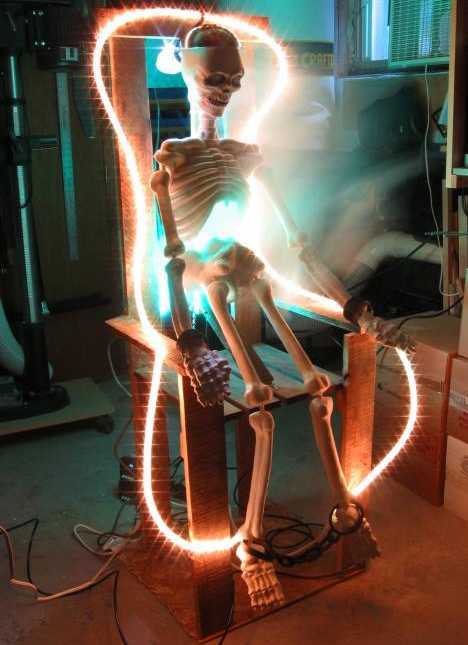 By now, someone would be calling 911, but at least a minute would have passed. Therefore, for this event chart, I’ve chosen to use 2:19pm, although it could be even earlier. The ascendant, its lord and the Moon represent the attackers. The 7th house and its lord represent the victim. The last degree of Leo rises. The Sun, considered a krura (cruel) planet of the Kshatriya (warrior) caste has dig bala (directional strength) in the 10th house. The ascendant is in a nakshatra of the Sun. Even the Sun is in its own nakshatra, further fanning this flame. Mars is a warrior planet in its own sign. Ketu also acts like Mars in general, but more especially when associated with Mars, and taking strength in Aries. Together in the 9th they reflect, for the attackers, inflammatory philosophies like jihad, thus a signature for fanaticism and zealotry, especially with Saturn at the other end of the nodal axis. Mars, the karaka (significator) of weapons mutually aspects exalted Saturn, the karaka of death. Mars rules the 4th house and their vehicle, which was used first as a weapon. Mars also rules cutting instruments, like knives and cleavers, with which they attacked the victim. Mars mutually aspects the Moon, ruling the 12th house of hospitalization, imprisonment and death. 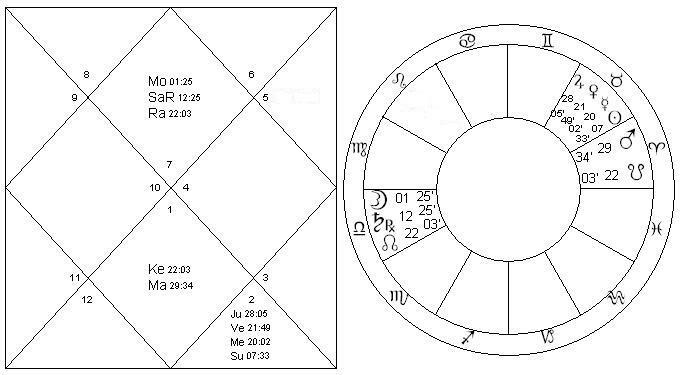 If we look at the chart from the Chandralagna, treating the Moon as if it were the ascendant, we get Moon, Mars and Saturn all aligned with the crazy-making Rahu-Ketu axis. A double-strength (exalted and retrograde) Saturn occupies the first house, opposing strong Mars and Ketu in the seventh. From Chandralagna the 11th lord Sun, reflecting desired goals, goes to the 8th where it joins the three trik lords – 6th lord Jupiter (combat), 8th lord Venus (trauma) and 12th lord Mercury (death). The attackers’ intention was clearly to wreak violence. This all occurred during a two-week period of Kala Sarpa, which is a yoga (planetary combination) wherein the Rahu-Ketu axis identifies a line, and all planets lie on either one side of that line or the other. Different texts offer different definitions of Kala Sarpa. A strict definition requires that Rahu and Ketu be alone in the signs they occupy, while the seven visible planets are distributed among the signs between. A more liberal definition allows other planets in the same sign as Rahu or Ketu, but none must disperse across the line of opposing degrees laid down by the Rahu-Ketu axis. This event chart is an example of that. 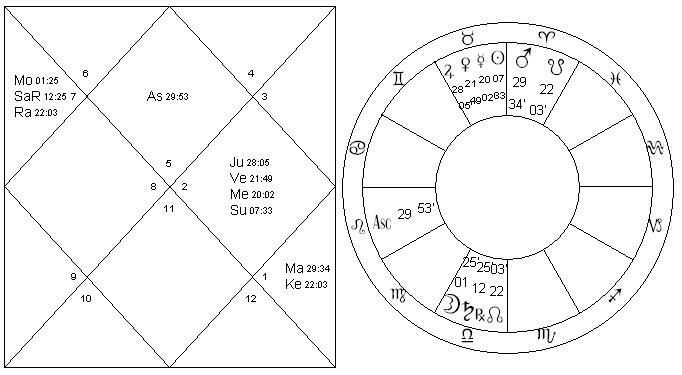 The current Kala Sarpa pattern has been in effect since May 12, when Mars crossed the degree of Ketu and all planets went to one side of the Rahu-Ketu axis. This continues intermittently now for roughly four months, until September 18th, when Venus will overtake Rahu’s degree position and end up on the other side of the Rahu-Ketu line. During this period, Kala Sarpa will be like an electrical circuit. When the Moon is on the opposite side of the Rahu-Ketu line from the other planets, two weeks at a time, the switch is off. But when the Moon crosses Ketu to join the other planets on the same side of the nodal axis, the switch turns on. Kala Sarpa is alive! This could spell a violent season. Although it didn’t meet the definition of a Kala Sarpa Yoga, the Boston Marathon bombing also had Mars and Saturn sitting in strength at opposite ends of the nodal axis, giving these four malefics a rare concentration of power. For a discussion of the Boston bombing, see my earlier posts: Bombs in Boston & Combust Mars, and Boston: Out of the pressure cooker and into the fire. Although Mars has now left Aries, the presence of Saturn on the nodal axis leaves its stamp on the intermittent Kala Sarpa Yogas that appear over the next four months. We might reasonably expect, however much we’d rather not, that other such incidents will bloody the front pages of the media. Terrorism’s face is changing. A Canadian think tank called The Mackenzie Institute has long claimed that, because of greatly-heightened security in America, Europe and elsewhere, we’ll probably never again see an act of terrorism on the scale of 9/11’s TwinTowers. Rather, the Mackenzie Institute expects jihadi world-wide to engage in small-scale acts of opportunity terrorism, the fundamentalist equivalent of Think globally, act locally. It’s awful to think that your next trip to the movies could be a real-life horror film, but let’s face it, for someone of the mind to use a weapon or two, the daily opportunities are too numerous to count, too horrific to dwell on. Small successes like Boston and Woolwich inspire zealots everywhere. They don’t need to bypass security and hijack a plane. All they need is a human target and a weapon and a few witnesses to record it for the evening news, and it’s out there for the world to see. 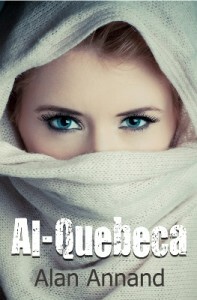 I recently explored this idea of local opportunity terrorism in my latest mystery/thriller, Al-Quebeca. In it, a Montreal sleeper cell is aroused by a single event halfway around the world. They start with a hit-and-run, then shoot two people, then poison gas three others. The detective who investigates the hit-and-run is still mourning her brother’s death during covert ops in Afghanistan, but eventually discovers the thread of a plot. Assassinate an American governor, disable New England’s electrical grid, and kill 10,000 hockey fans – all in a good night’s work.